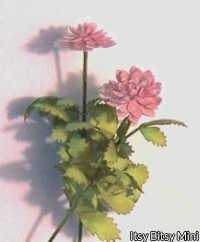 Designed by IGMA Artisan, Bonnie (Lavish) Morris this realistic 1" scale flower and foliage kit is precision laser-cut from acid free paper. Assembly is fast, simple and fun. Flower kit includes easy to read instructions and materials to make 6 flowers. Features extra detailed leaves. Other available colors: Red, Purple, Pink, Orange, Yellow, White.